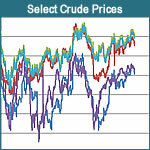 Historic crude oil prices collected for select locations. Historical prices are collected from Flint Hills Resource bulletins and Platts North American Crude Wire beginning January 2, 2001. Contact us for more information. 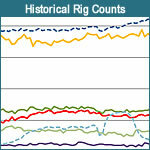 Historical rig counts collected since February 2005. Collected counts include working rigs and shallow plays. Data supplied by Platts Gas Daily. 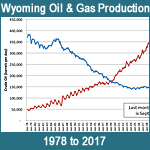 Contact the Wyoming Pipeline Authority for more information. 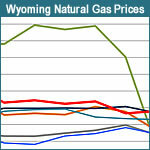 Midpoint spot natural gas prices collected for various cities around the United States and Canada. Historical data collection begins in January of 1999. Contact the Wyoming Pipeline Authority for more information. 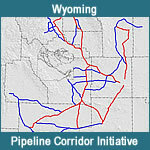 Wall Map of Wyoming’s Pipeline Infrastructure for Sale. Please call 307-237-5009 for more information.